A little diversion for me next: straightforward classical history. 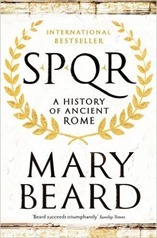 I’ve read SPQR: A History of Ancient Rome by Mary Beard. SPQR Senātus Populusque Rōmānus is the motto of the city, meaning “The Senate and People of Rome”, it has been used since antiquity and is still in use now. The book starts with the story of Cicero and Catiline in 63 BCE, Cicero revealed Catiline’s plot to overthrow the Roman government. It is presented as the first events where there was significant documentary evidence from multiple sources. Proper history, if you like. Even then what survives should not necessarily be read as gospel truth. Rome prior to this was seen in fragments. Beard returns to this theme of what the evidence is and how much we can trust it throughout the book. As I read through I discover that the earliest copies of Roman writings date from about 500 AD, anything written before then has been transcribed perhaps several times. Some of this writing sounds like it is in the form of what we would understand as contemporary books but other parts are the selected, edited letters of important people. In neither case are they published and promoted in the way we see modern publishing. In terms of contemporary texts, the inscriptions on tombs and monuments provide a second source of material. In earlier years these inscriptions were limited to the most important but in the first century CE there was a huge expansion of tomb inscriptions from what appear to be relatively ordinary people. There is some writing preserved in wall paintings and less formal graffiti in rare places, like Pompeii. There is some material from the Vindolanda tablets, found at Hadrian’s Wall. We also learn of the books that are lost from references and quotes in other extant works. The book then returns to cover the history of Rome in chronological order. Starting with the founding myth of Romulus and Remus, purportedly raised by wolves. Subsequently Romulus killed Remus over an argument about where to found the city which was to become Rome. The founding story of Romulus and Remus and fratricide can be seen as a retrospective “justification” for the almost continuous civil war within the Roman Empire. Archaeological evidence shows settlements on the site of modern Rome from around 800BCE. A second theme of the myths of early Rome is the way in which the city grew by assimilating neighbours, you didn’t need to be born in the city to be a Roman, you didn’t even need to live there. The city welcomed incomers. Rome ran through a sequence of political structures, starting with the Regal Period (of kings) which was replaced with the Roman Republic, where two elected consuls ruled, in 509 BCE. During this period trying to re-introduce a monarchy or calling yourself “king” was seen as anathema. The consuls were finally replaced with Emperors in 44 BCE after the Roman Empire had reached almost its greatest extent. It was experimenting with ways of being a state, in the sense that the prevailing organisations at the time were on a city basis rather than a country. We take the nation-state and its political and bureaucratic structures pretty much for granted these days, for example, we have courts and police forces and so forth. In the years of the Roman Empire these structures were not well-established, and much of SPQR describes Romans feeling their way in establishing political structures. It’s easy to project the modern world onto the Roman Empire but really it is very different. 20% of the population were slaves, newborn children were fairly casually abandoned. There was no effective system of justice in terms of an established police force or a court system designed to address simple crimes of property or violence against the ordinary person. The great majority of the written record of Rome refers to “Great Men” but Beard writes a couple of chapters on what can be inferred about women and the poor. Strikingly the poor were more likely to “eat out” than the wealthy – they couldn’t afford kitchens of their own. I pleased to learn that the Emperor Caligula was named for his “Bootikins”, he was taken on military campaigns as a child and dressed in a soldiers uniform with “little soldier’s boots” – caligula. And a Roman writing from Britain writes of the Brittunculi – the Little Britons. Rather relevant to current affairs is the tombstone of a British woman, Regina, born north of London whose husband, Barates from Palmyra in Syria, commissioned the monument, placed near South Shields in the first century CE. The book ends in 212 CE when the Emperor Caracalla grants everyone in the Roman Empire citizenship. This falls approximately a 1000 years after the founding of Rome, the Roman Empire in the East was to last another millennium but Beard leaves this story to another writer. At first sight this is an intimidating tome but it reads well, and clearly. It revealed sufficient of the underlying methodology of classical scholars to pique my interest.